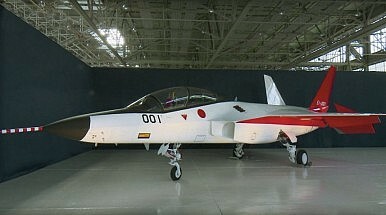 Japan’s Ministry of Defense Acquisition Technology & Logistics Agency (ATLA) is expected to discontinue work on a domestically designed fifth-generation fighter jet due to budgetary concerns and critical capacity shortages in the country’s military aircraft industry, The Asahi Shimbun newspaper reports on March 5. Japan’s Ministry of Defense will purportedly not seek funds for the development of Mitsubishi Heavy Industries’ experimental fifth-generation fighter technology demonstrator X-2 “Shinshin” (formerly the ATD-X) when requests by agencies and ministries are compiled this summer for the fiscal 2019 defense budget. As of this writing, Japan’s MoD has not publicly commented on the March 5 report. The X-2 prototype was intended to serve as the basis for the development of Japan’s first indigenously designed fifth-generation stealth fighter jet, designated the F-3. Japan is now expected to collaborate with the U.S. defense industry and other international partners to either jointly develop a next-generation stealth fighter jet or purchase jets directly from a foreign vendor. The decision to scrap the program was not unexpected for Japan defense watchers. As I explained in July 2016, Japan had three options for procuring for the new aircraft: “First, develop an indigenous air superiority fighter. Second, partner with a foreign defense contractor and license-produce a new aircraft. Third, import or upgrade an existing platform.” The first option now appears to have been nixed. Interestingly, U.S. defense firm Lockheed Martin has been involved with the F-3 program in some unknown capacity and is a possible candidate for a future collaborative partnership. The recent news that Japan is interested in procuring at least 20 additional ready-to-fly F-35A stealth fighter jets from Lockheed Martin could be a first sign of an emerging Japan-Lockheed Martin partnership in that regard. Japan originally intended to procure Lockheed Martin’s F-22 Raptor, but the U.S. government refused an export license, forcing Japan to initiate its own stealth fighter jet program in the 2000s. The Japanese MoD plans to induct up to 100 fifth-generation fighter jets by the 2030s. A contract, estimated to be worth over $40 billion, was initially expected to be awarded this summer, but there has been no official progress report on the tender so far in 2018 and the decision will most likely be postponed. According to various sources, the Japan Self-Defense Force (JSDF) is also interested in purchasing the F-35B – the U.S. Marine Corps variant of F-35 Joint Strike Fighter capable of vertical or short takeoffs and vertical landings without requiring a catapult launcher. JSDF would deploy the aircraft on Japanese islands skirting the East China Sea and aboard Izumo-class helicopter carriers, which will make the acquisition of such platforms a politically sensitive subject in Japan.